Care2 Causes | Will There Ever Be a DACA Vote? Will There Ever Be a DACA Vote? It was just a day into the latest government shutdown when negotiations between Republicans and Democrats reached fruition: The parties agreed on a three-week continuing resolution and — more importantly for the hundreds of thousands of children on CHIP — a six-year funding extension for the federal Children’s Health Insurance Program. Democrats also got a promise — an eventual vote on Deferred Action for Childhood Arrivals, or DACA. But we’ve heard this promise before, of course. After all, being allowed into DACA negotiations was Arizona Senator Jeff Flake’s payoff for voting with his fellow Republicans to pass so-called “tax reform.” Does doubling down mean the right will actually allow a vote, or are they just yanking the football away once again before anyone kicks it? A vote on DACA is imperative for the mass of DREAMers who are on the verge of being deported starting in March. Many of these undocumented immigrants do not even remember their home countries, and they’ve often lived in the U.S. for decades. 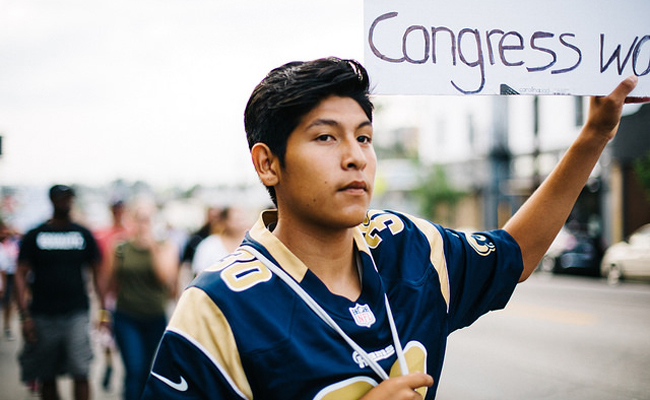 Despite the fact that nearly all Americans support allowing DACA recipients to stay in the country, the Republican party continues to use DACA renewal as a hostage in every negotiating situation Congress faces. No wonder even the Democratic leaders themselves are beginning to admit that maybe — just maybe — they got played. Senate Democratic leader Chuck Schumer acknowledged Tuesday night that he has no guarantee that Senate Republicans will allow a vote on immigration in the next two weeks, an agreement he’d touted as the reason Democrats voted to end the government shutdown. Schumer announced on Monday that most Democrats had agreed to support a procedural measure to end the funding impasse, which closed government operations over the weekend, in exchange for Senate Republican leader Mitch McConnell’s promise of a vote to extend the Deferred Action for Childhood Arrivals program, or DACA, by Feb. 8. If an immigration deal isn’t reached by February 8, McConnell would bring a bill to the Senate floor for debate — though he did not specify which one. He has one condition: Senate Democrats can’t shut down the government again on February 8, when the most recent short-term spending bill expires. The immigration debate would have a fair and open amendment process. As Scott notes, nowhere is an actual solid promise on a vote regarding DACA itself. Meanwhile, with Democrats losing leverage on a shutdown in February, there’s little motivation for the GOP to work with them at all. And then there is the problem of President Donald Trump. With a year in office under his belt and few of his campaign promises actually fulfilled, he continues to claim that his line in the sand on DACA renewal is congressional funding for a U.S.-Mexico border wall. While most Americans oppose the wall — and wasting taxpayer dollars on it – the project still remains highly popular with Republicans, making it a hard policy for Congressional Republicans to publicly oppose as they head into a nasty midterm election. Especially since many sitting GOP members are facing off against even more far-right, anti-immigration primary challengers back at home. Well, on February 8 we will know for sure, as the continuing resolution expires and we’ll once again be on the verge of another government shutdown. And maybe the GOP will promise a DACA vote again. Or maybe they won’t bother to promise anything at all. Even with a vote on the table, its passage remains up in the air, too. Regardless, the fact remains that a large population of immigrants whose only crime was to have parents who wanted them to have a better life are living in fear. And sadly, no matter what occurs in Congress, it’s very likely that reality won’t change at all — at least, not for the next three years. and a speed-up is overdue for those who legally await their turn (before more of their numbers die off).